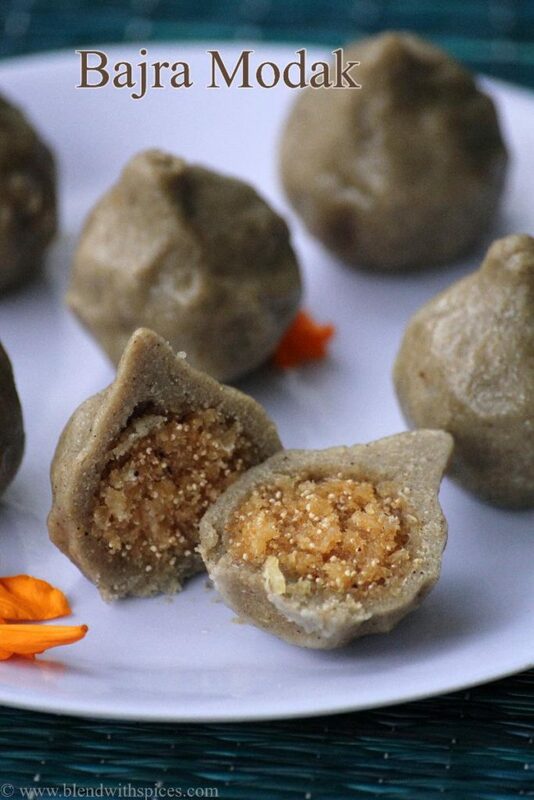 If you are looking for more Ganesh Chaturthi Recipes then do check Sweet Kudumulu, Bellam Thalikalu, Pala Undrallu, Pala Munjalu, Poornalu, Panchamrutham, Chana Dal Payasam, Ulundu Kozhukattai, Godhuma Rava Undrallu, Modakam and Bobbatlu. Dry roast the poppy seeds until light brown color. Add the coconut and jaggery it and combine. Mix well until the jaggery dissolves completely. Add the cardamom powder and cook on medium flame. Cook until you get a thick mixture. Switch off the flame and let it cool completely. Divide the mixture into 6 – 7 round balls and set aside. Add water and salt in a saucepan. Bring the water to a rolling boil and turn off the flame. Take the pearl millet flour in a mixing bowl. Pour the boiling water little by little and mix it well with a spatula. Let it cool for 2 -3 minutes and knead it to make a soft dough. Grease your hands with little oil / ghee and divide the dough into 6-7 equal portions. Flatten the each ball and keep pressing with your fingers to form a disc or cup. Place the prepared coconut stuffing in the center. Bring the edges together and seal it. Arrange them on greased idli plates or steaming plates and steam cook on high flame for 10 – 12 minutes.